The day has finally arrived (May 3), Kazumi is set to head out for her first shop job. I called in a few of my buddies (same ones I went with to get the Corona.) to come along for the journey, grabbed my toolkits and hopped into my daily driver and headed off to the warehouse where I left the Corona. First order of business, get the car running. I haven't started and warmed up the car for about a month so I was pretty sure it would have a hard time starting right off the bat. So I decided to give the carb a little clean with some carb cleaner, hooked the battery up to some jumper cables and started the car. It fired up but died shortly after, so I had to adjust the tension on the throttle cable and fired it up again and held the throttle down to a low RPM just to get the engine warmed up, after that, she ran and idled alright. The next step was to get the car off the jack stand because the left rear tire was flat, I bought a can of Mag1 Tire Inflator and Sealant and did as it instructed, got the car off the jack stand and we were off. For awhile now, I've been inquiring with various shops and asking about things I needed and wanted done, some said they could do it, some said they couldn't. The ones that said they could do it were located very far from me and not easily accessible. Except for one shop which I've mentioned in Part 1 of this series. The shop called Sushi Factory. I've heard a lot of great feedback and I've seen a lot of their impressive work. So that's where we were headed, location set on the GPS of the lead car where 2 of my friends were in and then it was me and my other friend in the Corona. Halfway through the scorching drive (It was a little past 12 noon and the Corona doesn't have any air conditioning.) my friend and I heard a loud pop. At first we thought it was just backfire until the following sound we heard was flapping, the left rear tire blew up. Literally. 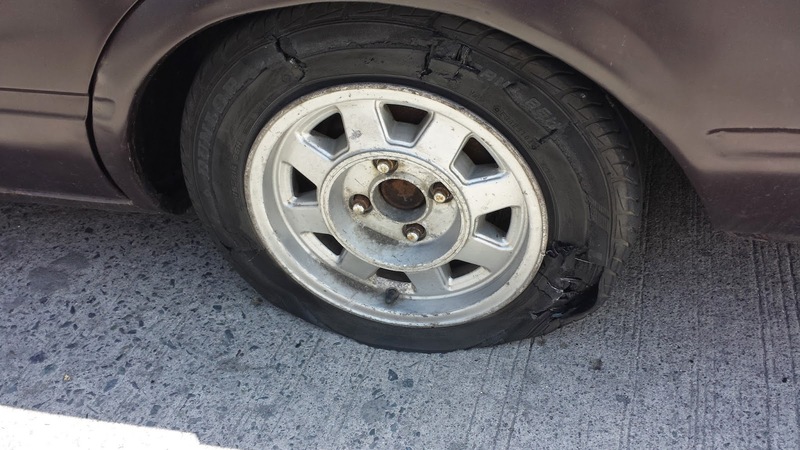 Luckily for us, we were near the shop already when the tire blew out. So we parked the car in a slot then headed into the shop. To give you an idea about the shop, it's a Car Wash/Car Restoration Garage, so naturally, there were some cars in the back which we made a beeline for. I finally got to see the famed Natsuki (a 1971 Toyota Celica ST) (Her photos are here: https://www.facebook.com/media/set/?set=a.316393681833388.1073741859.137794983026593&type=3) in the metal and wow is she gorgeous! I also got to see Makino the Mini Cooper (Photos here: https://www.facebook.com/media/set/?set=a.315604848578938.1073741853.137794983026593&type=3) there. If you noticed, there are no photos of the cars because I felt like I was too sucked in by the whole atmosphere that I completely forgot to take photos, total brain cramp. Haha. We got to meet the owner, Jeiven Perez. He gave off really good vibes as soon as we shook hands. He gave us a quick tour of his shop and talked a little bit about Natsuki and Makino then we got down to the business end of the trip there which was to address the suspension issue and the rim fitment issue as well as assess the rest of the car and that was that, I left Kazumi in the capable, talented and passionate hands of Jeiven and his crew. Now, it truly begins. I'm pretty stoked and at the same time pretty scared about this! Stay tuned for updates!